We understand that decisions made by legislators, agencies or local governments have the potential to change the entire landscape of your industry – and importantly, directly impact your business. We thrive on immersing ourselves in the issues you face and assisting you in developing a strategy to effectively communicate your needs to influential decision makers. Taylor Luther Group, PLLC (TLG) has extensive experience in government relations, legislative advocacy, and procurement and business development. Our team has been engaged to develop strategies and represent clients before a wide range of public decision makers, including the U.S. Congress and federal agencies, the Montana Legislature, the Office of the Governor and other executive branch agencies, cities and counties as well as special districts. 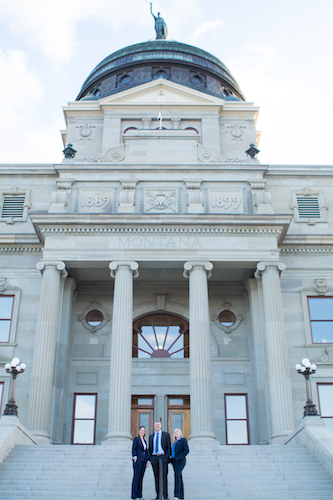 We have successfully lobbied for hundreds of pieces of legislation, assisted clients in achieving beneficial regulatory outcomes, and helped clients secure important business opportunities with the State of Montana. Over the years, the Taylor Luther Group team has established a reputation for honesty, credibility, and creativity. In addition, nobody works harder. Equally important, we are well known for our depth and subject matter expertise across a broad array of legal and public policy matters. Our bi-partisan approach combines sophisticated analysis and substantive understanding with strategic influence and fresh thinking to achieve successful results for our clients.